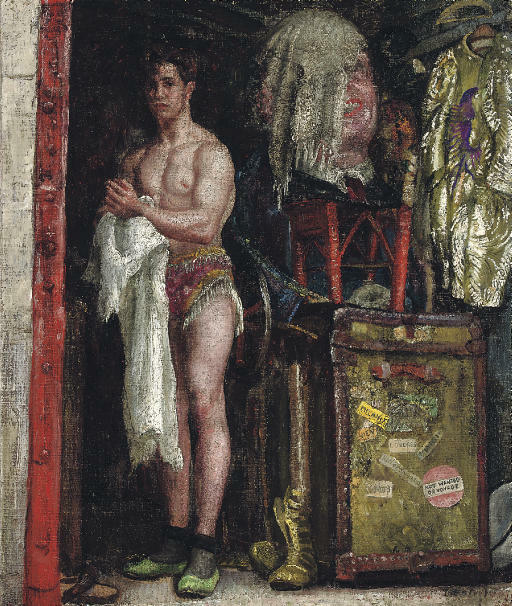 Explaining her attraction to the circus, Laura Knight wrote in her autobiography, Oil Paint and Grease Paint: 'It is the display of indomitable courage that one sees and admires ... Gravitation is defied - the impossible is possible ... It is the feeling of defiance for the laws of nature that makes the circus people a race apart; they are one, although gathered from all races. Circus performers are the hardest-working, the cleanest-living people I have met, with a a pride in their bodies, an ideal of attainment, and an infinite capacity for endurance'. This picture of one of the high-wire performing artists changing behind the scenes, dates from the 1930s, when Laura Knight travelled round the South coast of England with Fred Karno's Circus. The performers travelled widely, as indicated by the luggage labels on their trunks. Knight's association with the circus began when Alfred Munnings took her to the circus at Olympia and introduced her to Captain Bertram Mills, prior to her departure for America. She made friends with the performers and in particular with Joe Bert, an acrobat who with advancing years became a tumbling clown. As she later recalled, having spent many Christmas seasons at Olympia, 'between the Russian Ballet seasons and Barry Jackson's London presentations, painting the circus became a habit'. We are grateful to R. John Croft, the artist's nephew, for his help in preparing this catalogue entry. The picture will be featured in the forthcoming catalogue raisonné of the artist's work.